Carolina Broomball has been around for decades in Charlotte! 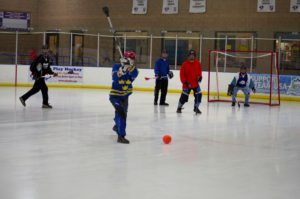 Broomball is a hybrid sport between hockey, soccer and lacrosse. Two teams running on ice try to get a ball into a net with “brooms” (aluminum sticks with a flat rubber head). Adults of any skill level are welcome to participate in this co-ed league! Get a good cardio workout without even thinking about it! The cost to play in pick-up games is $10, which includes all equipment needed (shoes, sticks, helmets with a cage, gloves, pads, etc). This is similar in cost to pick up hockey or open skate. If you end up liking broomball (and you will! ), you can also join the league which is the best bang for your buck on the ice! 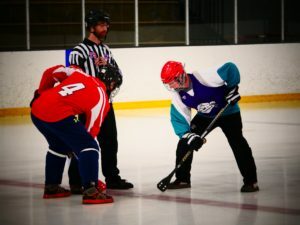 The league has a spring and a fall season with pick up games occasionally throughout the two seasons and pick up games regularly during the summer. Talk to us about joining. Find us on Meetup.com, Facebook and Instagram at Carolina Broomball!